There is 1 review for 'Infinite Dunamis'. A decent game, could have been much better. 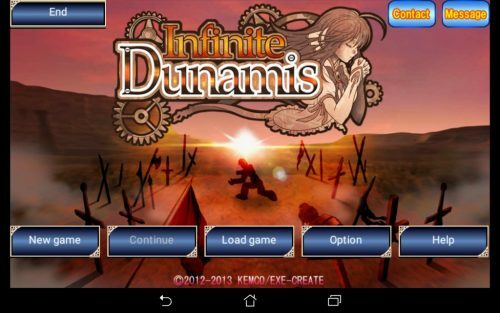 When I saw Infinite Dunamis, which can be compared very much to the old Alphadia games, I was quite taken in, if nothing else by the setting, although there were some red flags of bad writing. Two kingdoms constantly at war, leading to innovation of robotics, which turned on its masters and turned a war between the two countries into a war between all of humanity and the robots. The first warning flag I saw was when the two countries were described as a Kingdom of happiness and goodwill and fluffy bunnies and an evil Empire of doom, gloom and misery. Considering the plot is supposed to have themes of human potential, it seems rather weird that all the problems caused by humans can be traced to the evil Emperor- and maybe one other person – but certainly the entire Kingdom of Eleftheria is blameless. If you want to make a story about human potential shining through, you should start by making all humans seem fallible, rather than one side being pure from the start. And storywise, the characters take a bit to get used to. They’re not bad (except for Chelsea who I feel never changes from being sassy and a bit annoying), but they take a bit long to grow into their own. Character development should be a bit more gradual, so people don’t get burned out before getting there. Vince is my favourite, personally. And one major pet peeve is the backtracking. The game doesn’t give you an easy method of transportation until the very end of the game. It even takes away the item that lets you teleport to a previously visited town on NG+ so you have to do it, and at one point you have to cross the entire world for a couple of fights and go back, without teleports or a good method of transportation. The combat system is standard Kemco fare (very similar to the Asdivine series), except for the addition of Gaia Icons. These icons move across the same bar as everyone else, across the bottom, and when they reach the end, the effect is applied to whoever gets the next turn. These can be positive or negative, and is intended to represent the chaos of the world which has been destroyed by the war. While I wouldn’t want this in every game, it is an interesting mechanic and I kind of like it. Sometimes I wish the effects were less drastic as at extremes it can bring all your characters to 1 HP with a bomb, instantly kill one character, or restore your life and mana. Of course, bosses are immune to instant death. What is also interesting is that skills are learned from weapons (just weapons in this case), and mastering the weapon lets you use it no matter the weapon, but also, you can master weapons over 100%. With each percentage point over 100 the attack power increases, so it’s possible to finish the game with a starting weapon, if you like the special stats. In fact, that is what I did for Vince – Early on he gets a Shotgun that hits all enemies on a normal attack in turn for -10% Speed. This made him incredibly powerful early on. Estelle, the female lead, has a unique system (I believe replicated in Antiquia Lost) where she levels up by consuming crystals to pump her specific stats. She has unique methods of leveling up, and is much easier to break and get stupid levels of stats. Like Alphadia, there are the 4 elements to raise to 99 (though lightning replaces earth for some reason) that you wear rings for and can level to 99. On top of the usual organic enemies, there are also mechanical enemies that are immune to status effects, strong against fire and air, but weak against water and thunder. These are plenty used so thunder and water are the best. Now, the biggest problem with it is less that it’s bad, as much as it’s disappointing. You can easily see what the concept is and how it could have been amazing storywise, but as it is, it’s a pretty average game. Certain plot elements don’t show up until the end. And having to beat the game twice to get the real ending is a bad idea – The only other game that does it is Asdivine Cross, and that game does it in an amazing way that actually incorporates the NG+ into its storytelling (PLAY THAT GAME. )- In this case, the requirement is arbitrary. The game is difficult, and has an optional boss that will easily destroy you even if you can defeat the True End final boss without problem. To beat him, you’re going to need to grind for hours and max out your stats. He’s difficult enough to compare to Bloody Maidame Curie in stat grind requirements. So that’s something to keep in mind. IF you want to beat the optional boss, you’re going to have to sink hours into it grinding capsules. And speaking of Maidame Curie, I believe this is the first time the Maids were hinted at, being referred to as the “Receptionist’s Guild” who run the Secret Arena. A maid refers to the Guild as being run by her sister, who is not present- The first appearance of Jolie Curie as a random NPC? In any case, they appear as maids in some of the Secret Arena fights, and even use the common Unyielding Service. So, is it a bad game? Not really. It could be better, the combat system is engaging if you don’t mind the rest of the Asdivine style combat, the fact it’s a cross between Alphadia and Asdivine in system is interesting. It’s just very slow to start off with, and it could have been much better storywise. Unique and interesting mechanics. Lots of them.